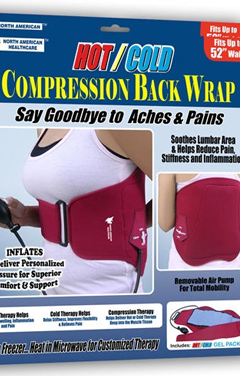 Say goodbye to aches & pains with this one-of-a-kind back compression wrap. Inflates to deliver personalized pressure for superior comfort & support. Removable air pump for total mobility. Soothes area & helps reduce pain, stiffness & inflammation. Heat Therapy helps relax stiffness, improves flexibility & reduces pain. Cold Therapy helps decreases swelling, inflammation & pain. Compression Therapy helps deliver hot or cold therapy deep into the muscle tissues. It's easy to use in any manner... cool in freezer or heat in microwave. Provides all over relief.